(2 hours before a bombing took place in Erawan shrine, even though it is unrelated) So on that same day, I decided to take a bus from the downtown of Bangkok to go back to my hotel. In a country with encrypted language where you could not even read any single instructions, there is a big probability that you will take a wrong bus. At that time, I took a wrong bus and almost ended up in my starting point, Don Mueang airport. In this situation, what's your best bet? Google and Google Maps, of course. So, I've decided to check two different transportation modes: public transportation and walking. Walking needs less than 2 hours for 8 km distance while public transportation (except taxi) needs around 1 hour for 12 km distance. The actual distance is actually less than that, because I did not arrived at the exact middle-point of Don Mueang airport. "Lost in Thailand" was started when I decided to take the walking route. It's easy to see that the walking route has a lot of differences with route for cars. My phone battery was around 20% left and I stupidly believed that it's enough to help me to reach the hotel. (At the time of explosion in Erawan shrine, again, it's actually unrelated, you know) I was lost and my phone was dead. I've realized how screwed I was because I've practically seen nothing in the darkness except trees in my port side and river in my starboard. One hour later, I miraculously arrived on the main road and now, I decided to check satellite views of the route that I took back then. As clever as it is, Google Map gave a walking recommendation to several back alleys without any precautions. Several minutes upon my arrival to the final destination (read: hotel), my friend asked me whether I has arrived safely or not. I have just realized that the downtown of Bangkok was in a chaotic state due to Erawan shrine's bombing tragedy. My first day in Thailand is indeed unforgettable. In the second day, I had to go to Burapha University which is located in Chonburi, Thailand. My lecturers and friends went to this meeting point separately, so I was still on my own self. The university is located around 106 km from the central Bangkok. 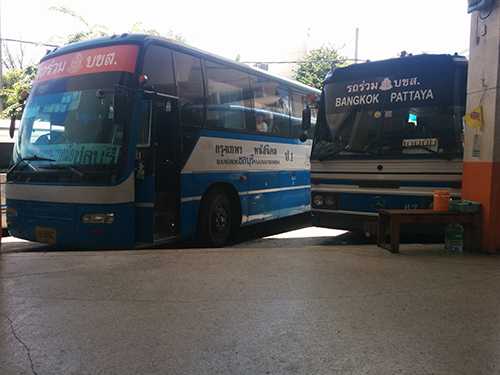 From my hotel to the bus pool, I changed the transportation modes for three times but there was no difficulty in it since I had enough experience with my first day "Lost in Thailand". The problem started when the following scenery appeared in front of you and you're still 12 km away from your destination. Google Maps could not give any suggestion for the public transportation here. I've tried to walk for several minutes and I've only found two kinds of public transportation: tuk tuk and motorcycle taxi. The real problem occurred here: they could not speak in English and I could not even understand a single Thai except 'kapunkap'. To put it short, the driver and I had the following conversations. Me: "I want to go to Burapha University"
Me: pointing out the destination "Bu..ra..pha Uni..ver..si..ty"
Me: pointing to the screen while typing Burapha University "Bu..ra..pha Uni..ver..si..ty"
Driver: typing some numbers into it ". . .Baht." Upon arrival to Burapha University, this long journey has come to end. Wait . . . Except, my hotel is still 2 km away from Burapha university. To make it worse, the hotel is not pinpointed in Google Maps and I believed that god of misfortune was laughing in the sky. I was in the front side of the university, while my hotel is located in the other side. I've walked past through the inner side of Burapha university and several students greeted me with "sawatdi[kha/khrap]". Since I still did not understand the greetings at that time, I've just simply replied it with a smile and a little nodding :) :) Put that greetings aside, I've finally trespassed (yes... trespassed) a private house area near the beach and fortunately, the owner could speak in English * oh finally *. The hotel is quite nice and I could spend my day in peace. The conference venue is about 3 km away from my hotel, but I had enough trouble for the first two days so nothing could surprise me. The first day was spent entirely for registration and welcome dinner. We had a dinner in "Blue Fin" restaurant with the typical Thai seafood foods (Tom yum, tom yum, and . . . you know). I've mistakenly identified a Japanese lecturer as a Master/Doctoral students and I've realized that it's futile to predict the actual age of Japanese people from their appearance :p.
From my home university, Institut Teknologi Bandung, 8 lecturers and 7 students from all degree (if I'm not mistaken) attended this conference, either as a committee or/and a presenter. As lucky as I was, both of my presentations were scheduled in the 1st conference day. My first paper was "TippyDB: Geographically-aware distributed NoSQL Key-Value store", which can be accessed here. If you're interested in the messy code, you can also access it here. I took this topic as my final project since I believe that network latency will become the bottleneck of performance in the near future. You could improve your computing power such as processors, GPU, etc, but it's extremely hard to improve the speed of latency between two continents. Honestly speaking, this project is far from good since I only implemented the solution in 2 months, which is a nearly impossible timespan to create a good NoSQL database such as MongoDB, etc. The interesting part is I could try a lot of new technologies (LevelDB, Raft consensus, Apache Thrift, etc). The second presented paper was "Elliptic curve cryptography: Algorithms and implementation analysis over coordinate systems", which can also be accessed here and the implementation here. This project is a short-term project during my one-month visit to JAIST a year ago. I believed that I've already explained this thing in the previous post, so I will skip the explanation for this one. After the conference ended, we had a tour to Pattaya Floating Market, which was also a part of ICAICTA 2015. Almost nothing was out of control, since there were a lot of Thai people who accompanied us. The floating market is quite similar with one that we have in Lembang, Bandung. (Rollback to the previous evening) This time, I had two of my friends with me: Fawwaz and Dyah. In Day 7, we went to a lot of attraction spots in Bangkok with lecturers and other students, such as Wat Arun, Madame Tussauds, etc. Finally, we decided to stay in the same place with the hotel that I stayed in the first day (Thanapa Mansion). My friends took a flight to Singapore around 6 am, so I was finally alone again during this scene. The previous god must be very happy to disturb me. During my peaceful sleep, a man knocked my room's door. Apparently, there was four policemen standing outside the door. They have found out that I'm a spy from foreign countries . . . wait, just kidding. To sum it up, It was just a simple security and safety check (which I could not understand why it should be in 7 am). Anyway, I lost my desire to continue sleeping and this first conference became very adventurous. Special thanks to Mr. Achmad Imam Kistijantoro as a supervisor of my final project, who has helped me a lot for this ICAICTA 2015 conference. "TippyDB: Geographically-aware distributed NoSQL Key-Value store" is an IEEE-copyrighted paper which can be accessed at http://dx.doi.org/10.1109/ICAICTA.2015.7335354. "Elliptic curve cryptography: Algorithms and implementation analysis over coordinate systems" is an IEEE-copyrighted paper which can be accessed at http://dx.doi.org/10.1109/ICAICTA.2015.7335349.